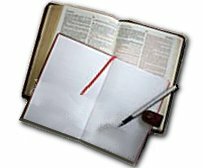 About the Bible | What Does the Bible Tell Us? There's a story about a proud young man who went to Socrates asking for knowledge. Speaking with much flattery, he walked up to the philosopher and said, "O great Socrates, I come to you for knowledge." Recognizing the young man for the pompous numskull he was, Socrates led him through the streets, to the sea, and chest-deep into the water. Then he asked, "What do you want"? "Knowledge, O wise Socrates," boasted the young man with a smile. Socrates put his hands on the boy's shoulders and pushed him under the water. Thirty seconds later Socrates let him up. "What do you want?" he asked again. "Wisdom," the young man sputtered, "O great and wise Socrates." Socrates pushed him under again. Thirty seconds passed, thirty-five. Forty. Socrates let him up. The boy was gasping. "What do you want, young man?" Between heaving breaths the fellow wheezed, "Knowledge, O wise and wonderful..." Socrates pushed him under again. Forty seconds passed. Fifty. "What do you want?" "Air!" he screeched. "I need air!" Socrates replied, "When you want knowledge as much as you have just wanted air, then you will have knowledge." The same could be said about Bible study. Certainly, there is much to be gained from studying God's Word; but first we might ask ourselves, "Why do I want more Bible knowledge?" Is it to make us better preachers, teachers and evangelists? Is it to impress others with our vast philosophical and biblical knowledge? Is it to appear holy and righteous as we spew Scripture after Scripture at any given situation? Or, is it out of a deep hunger and desire to crawl into God's very heart and learn all that He wishes to impart to us  collectively, corporately, and individually? After all, it's easy to quote Scripture and point our fingers at those who don't measure up. In fact, many in today's church have become experts at that. But to read the Bible from deep within the heart of God does more than simply make us better students and better teachers; it makes us more like Christ  more compassionate, more responsive to people's heartfelt needs, more forgiving, and in short: better equipped to impart life and healing with our words and actions. Every time we pick up our Bible, we should walk away challenged . . . humbled . . . changed. When we want to hear from God's heart as much as we want to breathe, then His Word will do just that: It will challenge us. It will humble us. It will convict us. It will shape us into men and women like the early Christians ["little Christs"] -- not moralists looking for some societal sin to confront, but compassionate Christ followers whose very lives make a difference in our world. The Bible reveals God's perfect plan for every person: our redemption through the saving work of Jesus Christ and our acceptance of Him as personal Savior and Lord. The study of God's Word demands our best attention. Thankfully, the Holy Spirit aids and teaches us as we study, but we must also give due diligence to our study. We must remember that we are reading God's personal revelation of Himself -- a letter, really, that tells us all that He wants to be in each of us, and all that He wants us to be in Him. It takes careful study to understand its deep insights into God's character and into our own. We need to allow God's Word to become such an integral part of us that we are ever-changed by it every time we open it. This lesson presents some very basic methods by which you might organize your study of God's Word. Without a plan, blueprint or pattern, it would be very difficult to build a house, sew a dress, or graduate from school. A plan makes any task more enjoyable and profitable. Adopting a specific method of teaching yourself will help you to learn the principles in Scripture more easily. Via the news media, personal correspondence, or perhaps your own personal experience, you are probably aware of people who have faced times when there was no rain for crops and no water for the animals. Maybe they didn't even have water for themselves. If you were faced with a situation like that, you would use every tool at your disposal to dig deep into the ground looking for a hidden stream. When you need something as important as water, you try as hard as you can to get it. In order to experience this living water, you must keep studying the Bible, not once, not just on Sundays, but day after day. And notice . . . we're not saying you need to read your Bible, which of course, you do; but you need to study your Bible everyday. Of course, reading your Bible everyday is a necessary part of Christian maturity. However, studying the Bible involves a specific plan or blueprint. And just as an archaeologist carefully digs into the earth to uncover buried artifacts and treasures, you must dig deeper into the Scriptures, look up cross-references, and make notes and outlines. And, depending on the Holy Spirit to guide you, you keep digging until you uncover more deep insights in the heart of God or into your own. Because "...the word of God is living and active, sharper than any two-edged sword, piercing to the division of soul and of spirit, of joints and of marrow, and discerning the thoughts and intentions of the heart." (Hebrews 4:12) You drink water everyday. Likewise, you should drink of the Living Water everyday. Why Is Studying the Bible Necessary? God desires that we love Him above everything else. If we truly love God, we want to spend time getting to know Him better. As we read and study His Word daily, our love for Him increases. No matter how much time we spend in God's Word, none of us can ever claim that we've learned everything there is to know about our awesome God. God's Word also tells us to give full attention to our studies so we can understand the Word of God and be able to teach it to others. "Do your best to present yourself to God as one approved, a worker who has no need to be ashamed, rightly handling the word of truth." (2 Timothy 2:15) Jesus also noted the importance of studying and knowing God's Word. He said, "...'Man shall not live by bread alone, but by every word that comes from the mouth of God.'" (Matthew 4:4). As we dig deep into God's Word and diligently search for all that He has revealed in His Word, we are fulfilling part of God's great command: "You shall love the Lord your God with all your heart and with all your soul and with all your mind." (Matthew 22:37). In Psalm 119, King David wrote about learning God's law. The word "law" in this Psalm means God's commands given in Scripture. David repeats over and over the idea that learning and obeying go together. He says, "Thinking about your commands will keep me from doing some foolish thing." (v. 6 CEV). God does not ask or expect us to understand and then obey. Rather, He assures that obedience produces understanding and wisdom to know the meaning of God's Word. Only then can we teach it to others. God made us, He is concerned about us, and He knows our needs better than we do. Think of it this way: A master craftsman knows his product better than anyone else does. If a product does not fulfill its intended purpose or design specs, the craftsman must repair or replace it. As God's Word makes repairs, it fulfills many needs in our lives. It helps us know the truth about our salvation. It teaches us what our heritage in Christ is. It gives us strength and power through Christ. It tells us how to be filled with the Holy Spirit. It provides true joy and peace that come only from God. It directs us how to live holy lives. God's Word shows us when our desires or actions are against God's will. It convicts us and helps us to shape our thoughts to be like His thoughts. Our desires and thoughts are at the center of our spiritual life in the same way as joints and marrow are central to physical life. The more we read and study the Bible, and listen to the Holy Spirit teaching us, the more we are able to know and do God's will. "Understanding your word brings light to the minds of ordinary people." (Psalm 119:130 CEV). As we study more of God's Word, then more of His light shines on us and changes us into the image of Christ. You "have put off the old self with its practices and have put on the new self, which is being renewed in knowledge after the image of its creator..." (Colossians 3:9-10). Then, the likeness of Christ can shine through us to a lost world who needs Him. When we truly know God through the revelations contained in His Word, then our spirits are joined with His Spirit, which is the source of Living Water. In this way our greatest need is met -- the need for life itself. The Bible is different from all other books. Just as you can understand a letter from your own family better than an outsider can, true born-again Christians can better understand the Word of God than an unbeliever can. This is possible because, as Paul tells us in 1 Corinthians 2:6-16, you have become God's child and you have His Spirit to guide and teach you. 6"We do, however, speak a message of wisdom among the mature, but not the wisdom of this age or of the rulers of this age, who are coming to nothing. 7No, we speak of God's secret wisdom, a wisdom that has been hidden and that God destined for our glory before time began. 8None of the rulers of this age understood it, for if they had, they would not have crucified the Lord of glory. 10but God has revealed it to us by his Spirit. The Spirit searches all things, even the deep things of God. 11For who among men knows the thoughts of a man except the man's spirit within him? In the same way no one knows the thoughts of God except the Spirit of God. 12We have not received the spirit of the world but the Spirit who is from God, that we may understand what God has freely given us. 13This is what we speak, not in words taught us by human wisdom but in words taught by the Spirit, expressing spiritual truths in spiritual words. 14The man without the Spirit does not accept the things that come from the Spirit of God, for they are foolishness to him, and he cannot understand them, because they are spiritually discerned. Being born into God's family is only a beginning. As we take God's Word into our very beings, we become hungry for more of His truths. As young children who come daily to their parents to be fed, we must come to God to have our spiritual hunger satisfied (see 1 Peter 2:2). Our attitude must also include discipline. We cannot expect God to reveal things to us unless we make a real effort to learn. The Scripture says, "Ask, and it will be given to you; seek, and you will find; knock, and it will be opened to you." (Matthew 7:7). This means more than a casual daily reading. Rather, we need to invest time in careful study. We can never learn everything contained in God's Word. Our study of the Bible is a life-long never-ending process that will even continue into Eternity, for we know that God's Word will not pass away (cf. Matthew 24:35; Mark 13:31; Luke 21:33).